Easily reduced to 32 speaking roles. See "Casting" heading below for full details. We normally supply a full Performance score with our musicals but because Go For Gold uses a large number of special effects which are supplied on the Backing Tracks CD we recommend that you perform this musical using the CD rather than piano. 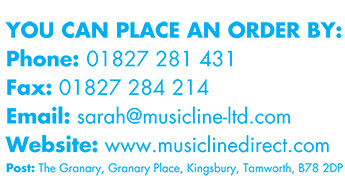 We do however have available a BRAND NEW Songs Only Rehearsal Score (Grade 4 / 5 standard) and a Very Easy Play Songs Only Rehearsal Score (Grade 1 / 2 Standard). A top athlete (Suzie Swift) is reported to be pulling out of the Olympic games due to lack of sponsorship. Her trainer (Phil O'Sophie) and her comical family are discussing the ins and outs of doing the games when Phil mentions how the games started in Ancient Greece and talks about some of the great heroes of those Olympics. There is a flashback to Ancient Greece (where the games began) with a truce from all fighting between states by the order of Zeus. 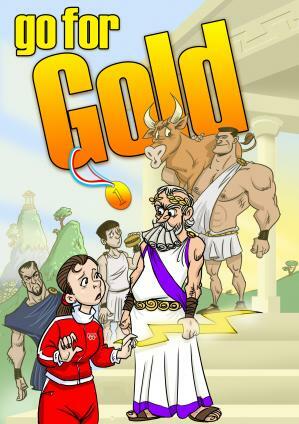 Zeus, (a "Cool Rapping" God) has a favourite athlete (Milo the wrestler) who is a six times champion at the games (he used to train by lifting a calf for 9 months until it gradually grew into a cow). Zeus is worried by Hades' (God of the Underworld) attempts to train a rival athlete to face Milo. However, Hades' man is useless (he has mistakenly trained by eating beef burgers instead of lifting a cow) so Hades tries to get the games cancelled by starting a war. The ploy fails in the end because there is too much love for the Olympics and everybody realises that the games can take the place of war. Suzie is so inspired by this story that she decides to compete after all and the Gods all arrive at the end to join in her celebration party. Go for Gold is dynamic, very funny and historically accurate - yes, the athletes really DID compete without clothes! This musical has gone down a storm in pre - publication performances - especially the songs - and is a brilliant way to enthuse your children about the greatest sporting event on earth.